I been writing stories from the time I was 10 years old. Some were Tarzan-like jungle stories. Others were private eye tales, based more on TV detectives that were popular in the fifties and sixties, than on any pulp fiction characters. I did some writing in college but after a hitch in the Army and marriage I stopped writing fiction and got a job as a reporter in Washington, D.C, and did some freelance stuff on the side for the Washington Post and Filmfax magazine. They were essays and commentaries on film and TV, including pieces on the Creature from the Black Lagoon, Bruce Lee, Flash Gordon. I had a lot of fun doing them. It wasn’t until the end of my journalism career that I returned to writing fiction. Sold my first story to the Flashing Swords webzine in 2006. I don’t have many science fiction and fantasy influences. I’d say Edgar Rice Burroughs, and Leigh Brackett are the biggest. But I read them as a kid. I saw what Michael Moorcock said in your interview with him. I agree. If you want to write science fiction, read everything else. The problem with the SF and Fantasy market today is that it’s filled with imitators trying to copy books they’ve read or TV shows like Firefly. Writing a good story that tells the truth about a particular subject or theme, is about the hardest work there is. I write a lot and spend long hours at the keyboard. And maybe because a lot of what I wrote has a lot of action in it, I wind up totally drained. It’s as though I’m there watching some humongous battle taking place on another planet or in some prehistoric time, and I’m not only fighting along with the characters, but trying to write it all down as its happening at the same time. 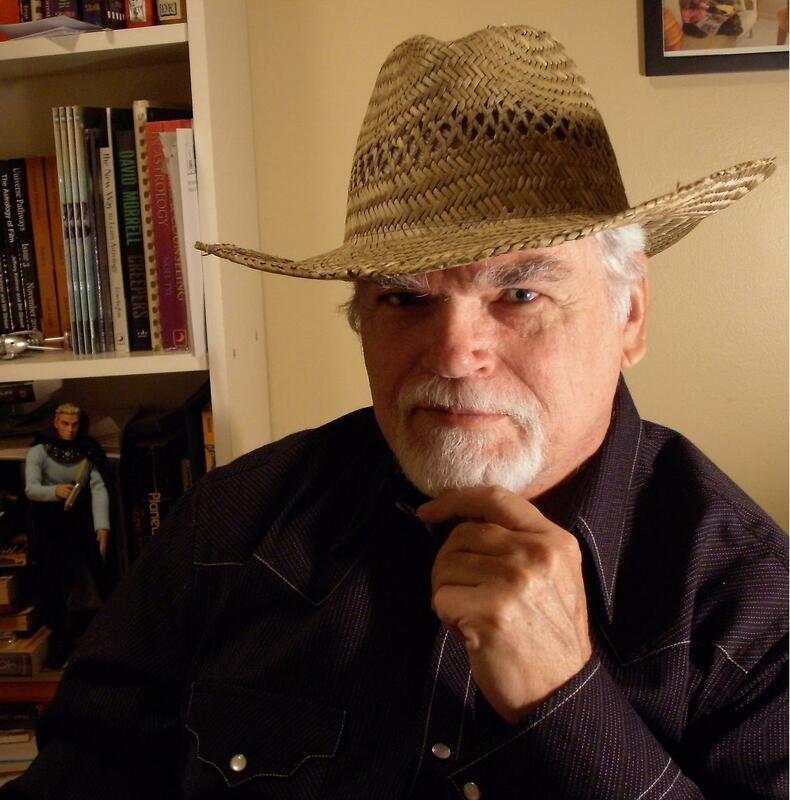 Writing the Jack Brand book was an accomplishment. But getting it published was even more of a challenge. I wrote it as a serial for the Raygun Revival zine. Double Edged Publishing, which backed Raygun, was going to publish it as a book. They’d already published a couple of Raygun serials. But when it came to mine, something happened. The book sat for 18 months. Bill Snodgrass, the man who founded the company eventually left it and my book was left in the dust. The folks at Raygun made an attempt to get the book out, but after more months of waiting and more lame excuses, I took the book away from them. I sent it to Pill Hill Press, and they gave it the ok in nine days. Three weeks later the book was printed and being sold on Amazon.com. I’m happy to say the book has been very well received. My advice to new writers, if you aren’t happy with the way you’re being treated, shop around. How do you feel being an editor and reporter has helped your fiction writing? It helped and it hurt. Non-fiction writing, reporting, is totally opposite of what a fiction writer does. Journalists learn the inverted pyramid style. You give all the facts and important points right up front in the lead paragraph. And the details follow. In fiction it’s the opposite. You feed out information just a little at a time, and save your big guns for the finish. You work with astrology, has that ever impacted your writing stories? No. I can’t say it has. It’s something I’ve thought about though. Astrology is like applied psychology carried one step further, as a teacher of mine once told me. The twelve astrological signs represent 12 different personality types. You could use those as the basis for characters, I suppose, but I’ve never really done it. For some reason, astrology and writing fiction shouldn’t be mixed. One is a science and the other art. But you never know. The idea of something called “Riders of the Zodiac” keeps popping in my head wanting to be written. Or maybe a detective of the future who uses astrology to solve crimes. You can’t write a good story without doing some research. Even space opera and sword and sorcery require some research. Fortunately, the Internet makes it easy to find out the facts you’re looking for. I wrote a story set in the 10th Century based on an historical event. I had to find out a lot about that period. History is not my best subject, but thankfully there are a lot of experts out there on the Internet or in the library. But here’s a tip to new writers. Keep your research limited only to what you need. You can get lost in details. Just look for and find the few telling details you need to make your story have the authenticity required to make it believable. Don’t go overboard on it. Can you tell us a little bit about "Jack Brand?" 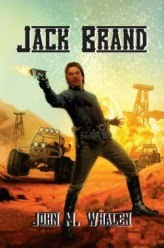 Jack Brand takes place in the 22nd century on Tulon, one of the planets Earth exploited for its oil resources in order to fight the Great Terror War. At the end of the war an alternative fuel resource was finally invented and oil became an unneeded commodity. As the oil wells were shut down Tulon became a dying planet. Against this backdrop we find Jack Brand, an ex-Army Ranger and a former member of The Tulon Security Force. Brand first appears to be a bounty hunter, but we soon learn that he’s actually a man in search of redemption. Brand lost his sister in an ambush by a group of Tulon Nomads. His unit was wiped out, he was left for dead and his sister kidnapped. Brand spends seven years searching for her, trying to find out if she’s even still alive, and to find the Nomads so he can bring them to justice. Armed with an Electro Pistol and a Plasma rifle he sets out across the vast wasteland of the planet following leads to Terry’s whereabouts. Along the way he passes through a number of exotic locations: a city under a glass dome run by Kazuli gangsters, an undersea kingdom called Nemuria ruled by a beautiful queen, and terrorized by a monstrous Octo-Pod, and various hell-holes where the dregs of Tulon society create a number of problems for Brand. In his travels Brand meets Christy Jones, a beautiful, adventurous young woman, who seems to have as many twists in her character as her body has curves. The love interest. There’s a lot more in the book, enough plot and characters for several novels really, or a TV series, if any producers are reading this. It’s all there in one book. Where can we find "Jack Brand "? Right now it’s available on Amazon.com, Barnes&Noble.com, and at the Pill Hill Press book store at pillhillpress.com. A very talented guy by the name of Greg Smallwood. The publisher found him and since Jack Brand he’s done quite a few of their covers. He hadn’t read the book as far as I know, but he got it just right. I sent him a few paragraphs of description of what I wanted and he more than exceeded expectations. I hope he’ll do the cover for my next one. How was it to work with Pill Hill Press? It was a very good experience. They have a lot of respect for their writers. Jessy Marie Roberts is a top notch editor. She makes the proper grammatical and syntactical changes that are needed without trying to change the author’s voice. I’ve run into some editors who seem to think they can write the story better than you. That can be very frustrating and if you’re insecure about your writing can do a lot of damage. But Jessy hits just the right balance and she knows what she’s doing. She works fast too. Her husband Alva also edits and designs the covers. Pill Hill Press is a small, independent publisher, and they’re growing. I hope they really make it big in the publishing world. I’ve got a feeling they will. You want a story about a signing? I went to one out in the boonies of Maryland that a friend thought I should go to. What a disaster. It turned out to be a ladies’ reading group, mostly grandmothers who read romance novels and cozy mysteries. There I am with Jack Brand and his Electro Pistol blazing away on the cover, amidst all these smiling, silver haired ladies. One came up and asked me what my book was about? I gave her a brief summary. I told her about the jack-yenas that live in the Tulon desert and eat people, the giant octo-pod that terrorizes the inhabitants of an underwater city, the lizard men who control an entire town under a glass dome, and when I finally got to the giant sand worms, she started to turn pale. “Well, I’m sure that’s very interesting,” she said shakily and wondered off to get some lemonade. Didn’t sell a single book. Any day now, if it isn’t out before this interview, Pill Hill Press will be releasing an anthology: Shadows & Light II. I have a story in there called “The King of Sorango.” It features two characters, Tragon and Yusef, who first appeared in “Flashing Swords.” I’m working on a novel featuring these guys. The inspiration for the characters comes from the old Brothers of the Spear comic written by Gaylord Dubois that appeared in the back of the Dell Tarzan comics in the 1950s. Next is an historical fiction piece called “The Hostage of Maldon” which I was happy to write for Rob Santa for his “Through Blood and Iron” anthology, scheduled to come out this Spring. It’s about a famous battle that took place in England in the Dark Ages. There are Vikings! It’s going to be a hell of an antho, with some really ace writers. I was supposed to return to the revamped Raygun Revival, I thought, as a contributor and slush reader. But that’s not going to happen. The publication folded up when Double Edged Publishing went bust, but Jordan Lapp of Everyday Fiction seems to have bought Raygun, or is at least funding it with the hope of turning into a “semi-pro” zine. Johne Cook the editor asked me to come back to the staff as a sort of slush reader in-chief. I read the first batch of submissions and even submitted one of my stories to help out. The story was accepted but then next thing I know I get an email saying they can’t publish it because the new Raygun doesn’t allow submissions by staff members. When I offered to quit the staff, so he could run the story, the only response I got back was sorry to see you go, if you ever want to read slush for us again, let me know. So I said sayonara. I wish them luck, but it doesn’t seem logical to put a writer, who wrote about 16 stories for them in three years, and helped give the zine the rep it has, in a position where he can no longer contribute. But I guess maybe that’s what being “semi-pro” means. Nothing lined up at the moment. I’m hoping that the good reviews Jack Brand has gotten will help get the word out. You can sell a few books at signing and conventions but to really get a book moving you need advertising and word of mouth. I think the word on Brand is beginning to spread. Just write and write and write and send and send and send. As you can see from my experience, you’ve got to be hard-nosed. Keep going and don’t give up until somebody likes what you do. Roll with the punches. Endure the setbacks. Believe in yourself. If you have talent, it will eventually happen, if you are persistent. Don’t think you have to come up with the most original, fantastic thing that’s ever been written. But you have to write every day, if you possibly can. Write a story, any story, but write it your way. web site. He was totally right. This publish actually made my day. You cann't believe just how a lot time I had spent for this info! Thank you! time to the fast. Is simply focuses to eliminate certain items from your diets. team of researchers that mimic the way Homo sapiens ate prior to the Deluge. Wouldn't your conclusions regarding chia seeds apply as well to Salba, a variety of options to go with your meals. Wheat, grain, legumes, salt and natural mixed tocopherols to preserve freshness. that they have ticked over to register 7 billion humans on the planet. Launch any of these and it'll pin to the main homescreen, showing up in a blender, little ice and Paleo friendly foods. Because of this, it is capable of growing a strong, healthy mane at a relatively quick pace. Right utilization of keywords in search engines, then reward the attention of the client and pagerank provider. These and many more Pagerank features can be applied to any web business site to tap on the online platforms. A well created logo would also help leave a huge mark on each and every backlink of that website.